Celebrations are afoot in Ontario celebrating 400 years of Francophone presence in the region. An important part of those celebrations is Samuel de Champlain’s exploration of Ontario and his early encounter with First Nations cultures. Simcoe.com has a short post on an exhibit that includes one of Champlain’s navigational instruments: “Historic astrolabe on display in Midland believed to have been Champlain’s.” Unfortunately, there’s a bit of confusion about this instrument, which is not in fact an astrolabe. This passing comment is the only place that Champlain’s instrument in correctly identified as a “mariner’s astrolabe.” Although the two instruments share one possible function—determining the altitude of star (usually the sun or the pole star)—that’s it. 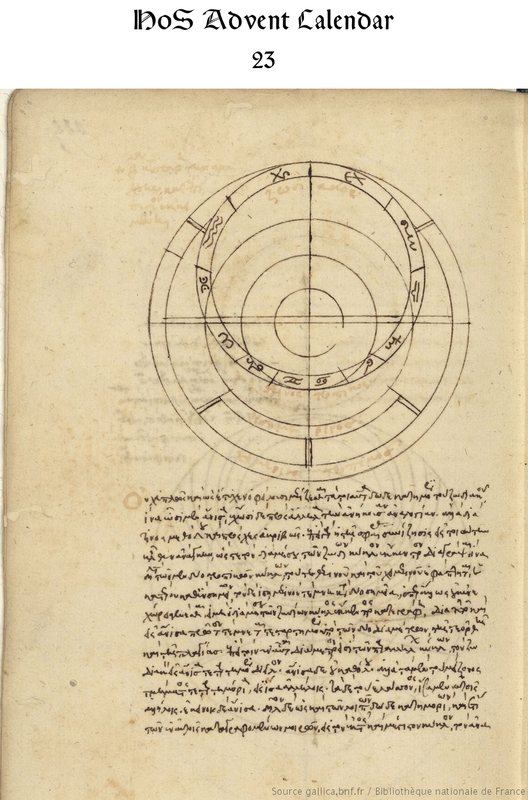 The astrolabe combined observations and calculations, allowing the user to perform hundreds of operations. It was both a complex, technical device and a status symbol. 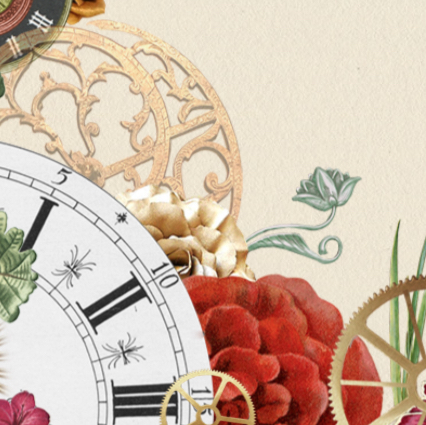 The astrolabe has been compared to iPhones and more recently to a complex Rolex watch. Astrolabes—pre-modern Rolex or iPhone, you decide. These comparisons capture the astrolabe’s status and superabundance of operations its operations. 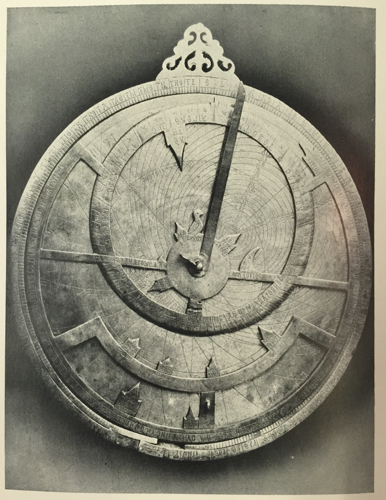 My pamphlet offers a handy introduction to the history, fabrication, and use of astrolabes. 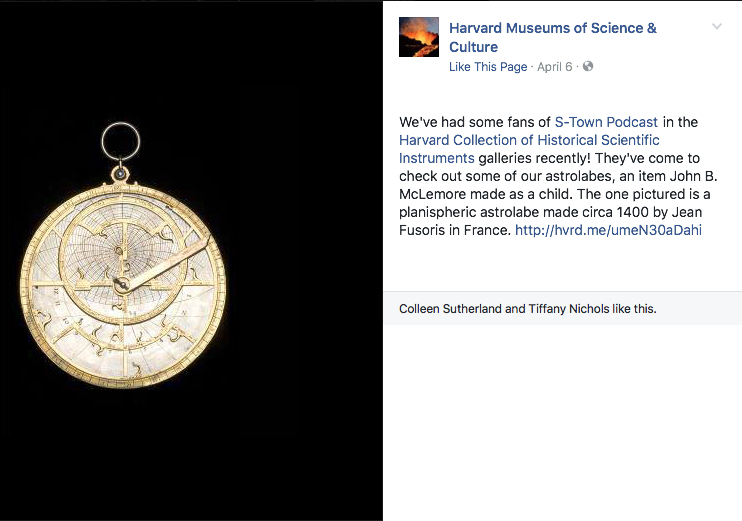 Hundreds of astrolabes survive. 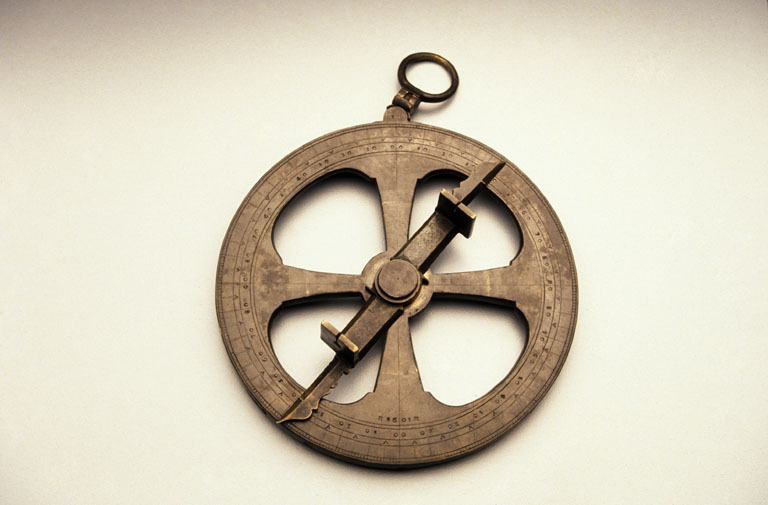 The mariner’s astrolabe, by contrast, was utilitarian and singular in function. It allowed the user to determine the height of the polar star or the sun and, thus, the observer’s latitude. The instrument’s design reflects its utilitarian function. Mariner’s astrolabes are typically heavy, made from a thick brass ring (only the limb of astrolabe) to limit them from swinging too much as the ship’s deck swayed and rocked at sea. Some had a ring at the bottom of the instrument from which to hang a weight for added stability. The body of the instrument was often cut away to reduce, scholars claim, the effects of wind blowing on the body of the instrument. 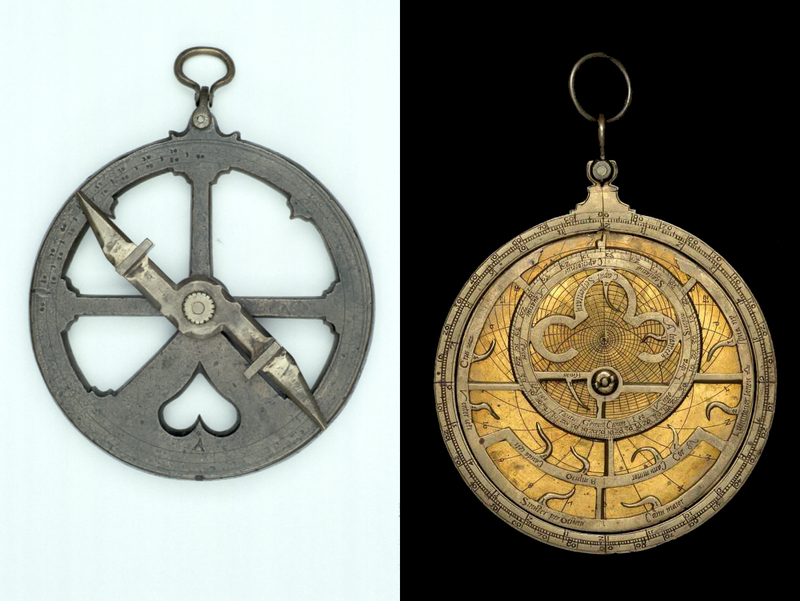 On the left is a typical mariner’s astrolabe from ca. 1600, from the Museum of the History of Science, inventory #54253, found here. On the right is a planispheric astrolabe, usually called simply an astrolabe. This is an early 16th-century astrolabe from the Museum of the History of Science, inventory #52528, found here. The limb was typically graduated from 0°–90° in the upper quadrants, once again reflecting its use as a basic observational instrument. A simple alidade with rather crude sighting vanes was attached to the front of the instrument. At night the navigator would look through the holes in the alidade to align them with the pole star. Then he could read the altitude of the star from the graduation on the limb, which altitude was, roughly, his latitude. If he wanted to know his latitude during the day, at noon he rotated the alidade until the sun shown down through the holes in the vanes (he would not look at the sun for obvious reasons). He read the sun’s altitude from the scale on the limb, added or subtracted the earth’s tilt based on the day of the year, and subtracted the result from 90° to obtain his latitude. 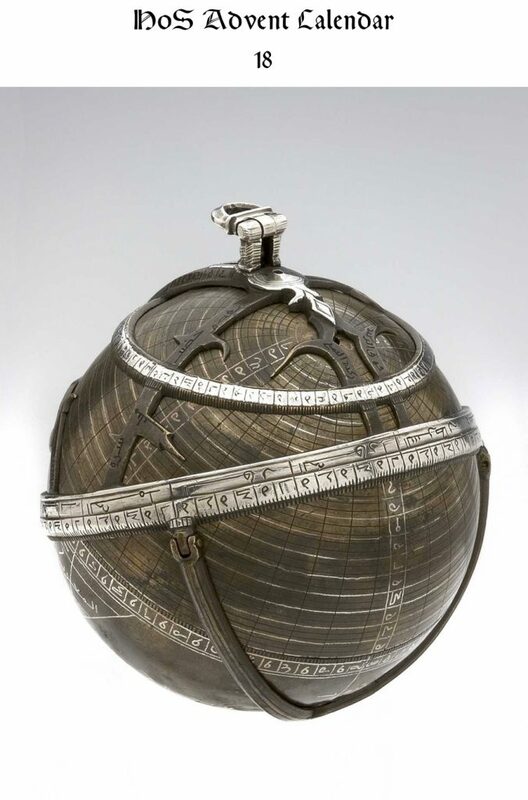 The mariner’s astrolabe was a nautical/navigational tool. Although an astrolabe could have been used at sea as a navigational tool, it is unclear that they were. The instrument’s many functions and finely graduated limb would have made it unnecessarily complicated and difficult to use on the deck of moving ship. Moreover, the astrolabe’s cost and status make it seem unlikely that a mariner would have owned one when there were other, more specialized and less expensive instruments that did the same thing. 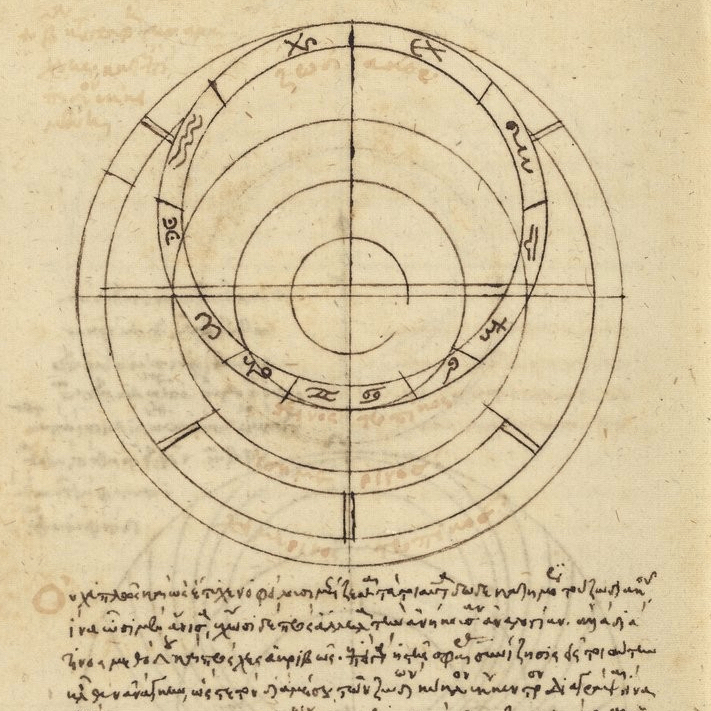 There are a few illustrations of astrolabes being used on ships, but whether these are idealized or meant to reflect contemporary practice is unclear. 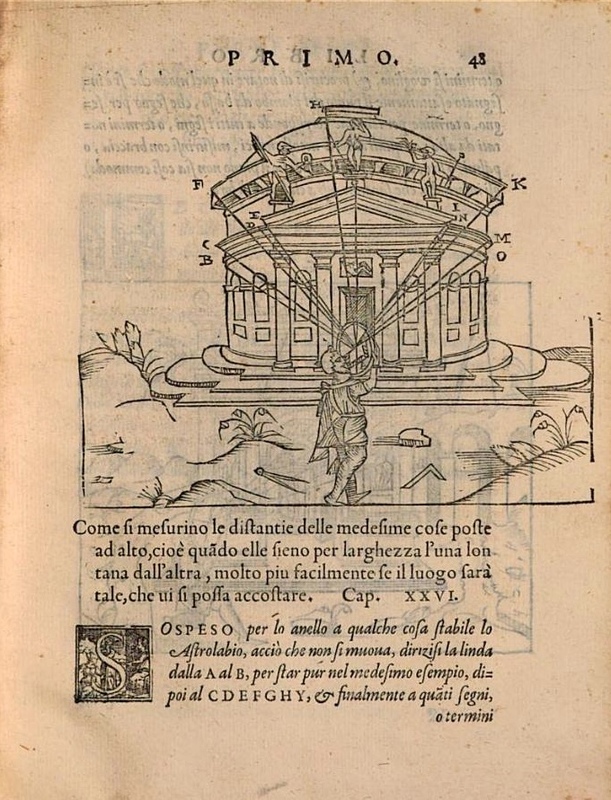 The various instruction manuals that include canons on how to use astrolabes at sea, e.g., Johannes Stöffler’s Elucidatio fabricae ususque astrolabii (1513), do not demonstrate that they were so used. 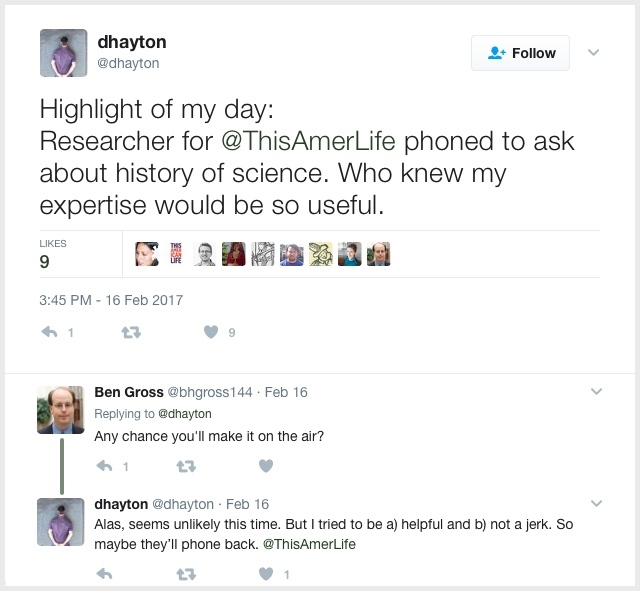 Authors of such manuals sought to distinguish themselves and demonstrate their expertise by cataloging as many possible uses for astrolabes as they could imagine, regardless of whether or not anybody actually used astrolabes in those ways. Surely few people used an astrolabe to make the many observations Cosimo Bartoli cataloged in his Del modo di misurare (1564). 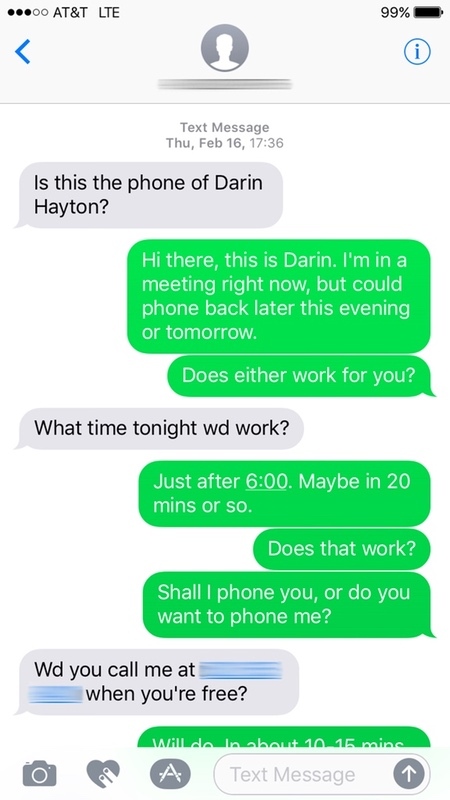 Google has scanned it here. Whereas traditional astrolabes were expensive, status symbols and were, therefore, collected and displayed, mariner‘s astrolabes were working tools. They were not, as a rule, collected or displayed. Consequently, much rarer today—only about 100 survive and most of those were recovered from shipwrecks (the Museum of the History of Science has a nice audio guide to the mariner’s astrolabe here). Champlain’s instrument was graduated from 0°–90° in each quadrant. The body has largely been cut away. And on the front is a large alidade for sighting. From this photo it is clear that Champlain’s instrument was a mariner’s astrolabe. From the Canadian Museum of History description—direct link to photo. It is plausible that he brought a mariner’s astrolabe with him as he explored Canada. But the story of Champlain losing his instrument by a lake, it having lain there in the forest for 250 years before a 14-year-old boy found it, and its subsequent sale to different collectors, seems almost too good to be true. And the instrument’s remarkable shape, having spent more than two centuries in the dirt, is equally surprising. Whether or not it was ever owned by Champlain, his instrument is clearly a mariner’s astrolabe. In May 1613, Samuel de Champlain, the French explorer-cartographer, travelled up the Ottawa River. To avoid the rapids, he chose a course through a number of small lakes near Cobden, Ontario. Champlain and his men were forced to portage and to climb over and under fallen logs at one particularly difficult point by Green Lake, now also known as Astrolabe Lake. It was here, according to several nineteenth-century authors, that Champlain lost his astrolabe. 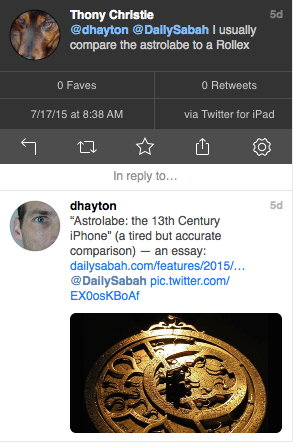 If this is correct, the astrolabe remained where it had fallen for 254 years. Eventually a 14-year-old farm boy named Edward Lee found it in 1867 while helping his father clear trees by Green Lake. Captain Cowley, who ran a steamboat on nearby Muskrat Lake, offered Lee ten dollars for the astrolabe. Lee never received the money nor saw the astrolabe again. Cowley sold the astrolabe to his employer, R.W. Cassels of Toronto, President of the Ottawa Forwarding Company. He in turn sold it to a New York collector, Samuel Hoffman. The astrolabe was willed to the New York Historical Society in 1942 where it remained until June 1989, when it was acquired by the Department of Communications for the Canadian Museum of Civilization. This astrolabe is unique. It is the smallest of 35 mariner’s astrolabes surviving from the early part of the seventeenth century and the only one from France. It is in excellent condition, except for one missing piece, a small ring on the bottom edge of the disk, to which a weight was likely attached to help keep the instrument plumb. The ring was probably broken off sometime in the late nineteenth century, since it appears in an 1879 photograph of the astrolabe.